The Tamil National Alliance parliamentary group leader and Trincomalee district parliamentarian, Mr.R.Sampanthan, at a special press briefing held Thursday evening at his Trincomalee residence, cautioned the Tamil people, especially Tamil youths, against falling prey into the hands of persons who are plotting to sabotage the peaceful environment in the Trincomalee district at a time when historically important events are to take place with the handing over of interim administrative structure proposals by the Liberation Tigers of Tamil Eelam (LTTE). 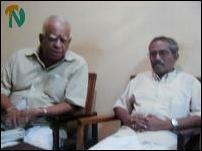 The saboteurs’ main aim was to put the blame for the violence on the LTTE to tarnish its image at a time when the LTTE has dedicated itself to finding a peaceful political solution to the ethnic conflict through the current peace process after two decades old war, Mr.Sampanthan said. Mr.Sampanthan hurriedly summoned the press briefing following the killing of two Tamil traders of Raalkuli village in the Muttur division Wednesday evening by unknown persons suspected to be members of a Muslim gang, sources said. TNA parliamentarian Mr.K.Thurairetnasingham was present at the press briefing. At the outset of the briefing, Mr.Sampanthan said several violent incidents had taken place in the Sri Lankan government controlled areas in the Trincomalee district during the last two weeks, reaching its climax last Wednesday with the killing of two Tamils who were residents of Raalkuli at Pachchanoor village. Mr.Sampanthan added, " On seeing the pattern of violence that is taking place in the district, we could see some hidden hands behind such incidents in order to provoke Tamil youths." He stressed that it was clear that the LTTE was not involved in any of the violent incidents that had taken place in the district. The LTTE is to submit its interim administrative structure proposal to the government Friday and to reveal its contents to the people of the country on Saturday at a press briefing in Kilinochchi, reminded Mr. Sampanthan. Mr. Sampanthan continued: “At this juncture, some elements are plotting to create trouble in the district and to put the blame on the LTTE. "Two Tamil civilians were killed Wednesday with the objective of provoking a retaliation, thus giving the plotters an opportunity for blaming the LTTE for such violence. We therefore appeal to Tamil youths to remain calm and not be provoked into engaging in any violence.